Leopard print all the way. This is a 1.5 inch grosgrain ribbon wrapped in a boutique style with the same ribbon for the French knot center. This leopard print is black, white, and a goldish-brown. 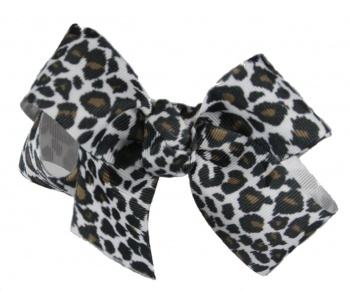 Leopard print lovers will have to get this one! This can be embroidered with initials on the tails, just add it on in the cart.